Excellent footless coaster. One of the best I have been on. I also rode this a Geauga Lake when it was there. It is about time that MA got a new roller coaster. But i think they would have been better off with something else. This ride has a huge line because when i went there they were only seating every other seat. That and unfortantly it broke down all the time. It seems like whenever I got close to riding it would break down. I eventually got on it tho and i have to say that it wasn't all that it was made out to be. I mean the feet dangling in the air is a experience in itself but i wish i wouldnt have waisted so much time waiting to get on this ride. So therefore i give it a 7/10. But im goin 2 give this ride another try and hopefully i reap better thrills this weekend. HOPEFULLY! 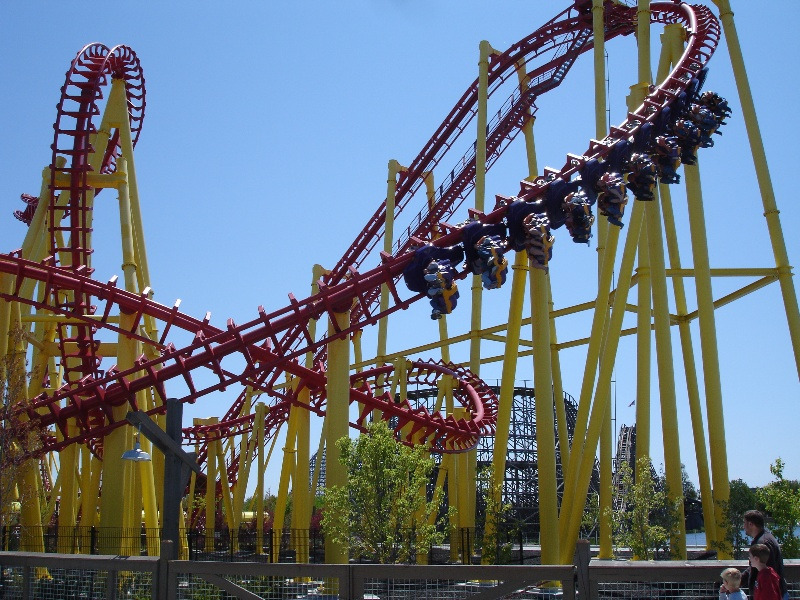 In 2008, Michigan's Adventure finally got a new roller coaster. 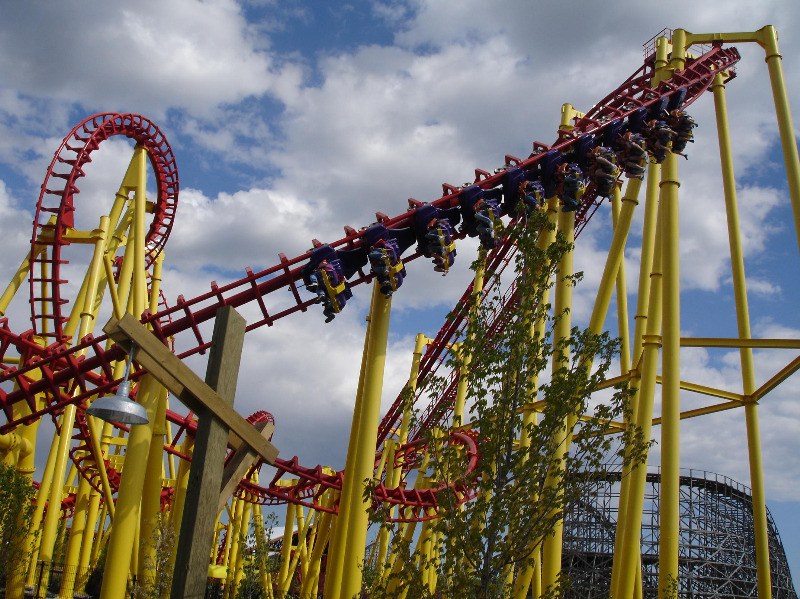 Thunderhawk, being an inverted coaster with 5 inversions was the first major coaster Michigan's Adventure had got in a decade. After reseaching about SLC's a little bit, I became a little worried about the reports of headbanging on these rides. Good thing I was proven wrong. When I rode this ride on opening weeked, it was amazing. It was giving smooth and exciting rides and the whine of its lift hill motor made its presence heard throughout the park. Its smoothness actually rivaled what has made B and M famous. The footchoppers on this ride are phenominal. I felt like I would lose my feet at several parts of the ride, especially during the disorienting double barrel roll. But the best part of the ride is being at the top of the lift hill in the front row. You look down about one hundred feet and become dizzy. 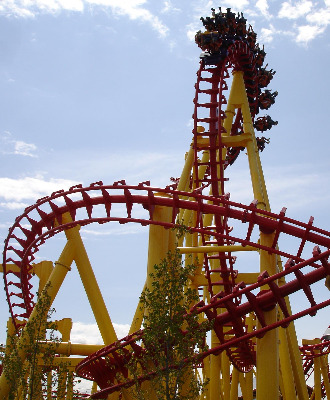 Then, it feels like the train actually slows down, giving you time to freak out about the twisting drop about to come. I came back to the park a couple weeks later to find that the ride had become a bit rougher. It might have been a bit more acceptable, but my friend made us get on like 5 times in a row, and I grew a little sick of it. 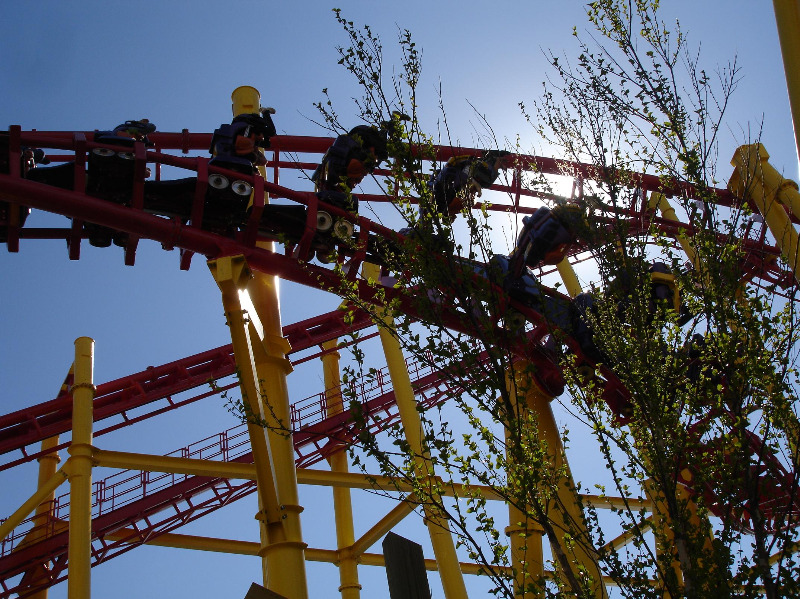 Thunderhawk is still a great ride and a necessary addition to Michigan's Adventure's lineupe, but the jolts throughout brought down this rides perfect rating. EDIT: After riding Thunderhawk again on 5-17-09, I have decided to update my review. I found that if I leaned forward, the problem of painful headbanging was eliminated, and Thunderhawk became very reridable. As far as seating goes, the first seat is best, but if they're only running one train, the wait can be up to a half hour IN the station. Any seat on this ride is good. Sure, this ride may be another Vekoma SLC. But this ride is not &quot;Just&quot; another Vekoma SLC. This ride has many things going for it. First of all, the station is beautiful. Easily the best at Michigan's Adventure. Secondly, being relocated after being decommissioned, I expected this ride to be a creaky, shaky, rough mess. I was wrong. It handled all the curves with all the grace of a brand-new roller coaster. However, the best part of this roller coaster is the location. It is near the back of the park so it is a bit of a walk, but it is placed right alongside the park's Swan Boats lake, which really adds a nice touch. The path is so close up to the ride that you can feel the wind from the trains thundering past. And the first drop banks out over the pond in such a way that makes you feel as if you are about to fall out into the pond. The intensity on this ride tends to be very tough on your stomach, which is why this ride didn't score a 5/5 with me, but if you have an iron stomach, this ride is for you! I have heard amazing things about this coaster and I want to experience them too so I&#39.m going to give this coaster another try when I go again but this time things didn&#39.t go so well. It&#39.s a new ride so I can understand that they would be doing maintenance. It opened up an hour before the park closed so I rushed over and claimed myself a spot in the very front seat with a friend. They were only seating every other seat (I heard a rumor that it was because the weight of that many people would slow it down too much... but who knows. Was it like this when anyone else went there?) I was worn out from the long day and the sun when I rode it kind of seemed like a daze. I&#39.m 5&#39.3 and the restraints didn&#39.t really hold me in place. Though the ride is pretty smooth all-together my head kept bashing into the sides of the restraints and my neck hurt for the next week after riding. Plus, probably another factor of height I couldn&#39.t really see around the restraints because they go so far out infront of you (unlike other inverted rollercoasters I have been on). It may have been due to the fact that I am slightly smaller so I slid to the back of the seat, but it just wasn&#39.t that thrilling. I can&#39.t really say too much because it was a forgettable ride. I do remember some twists and turns being pleasing. So I am blaming my disappointment on the fact that I was completely worn out and I&#39.ll put up another review after the next trip. The only reason I didn&#39.t ride it over that day was because as soon as it opened up the line became huge. The best SLC out there and I dare say almost comparable to B&M inverts. It just shows that a vekoma can be very good if taken care of correctly. Not only did it perform the inversions smoothly it did it very intensly and made for an exceptional ride.